“Mind if I wait here?” asked an unfamiliar man I’d seen walking ahead down the alley, stopping by the mews where I live. He didn’t look like the usual audience – none of the backpack, notebook or flask of tea about him, but tailored coat, three-piece suit, polished shoes. I suppose he’d been to the races. “It should be, specially since the railway pulled down that wall.” I pointed to the sad stump of a Victorian original that had buckled with age and turned dangerous. “They did right,” he said, and from his standpoint that was clearly so, though I doubt “they” had in mind his wishes, any more than those of local residents. We’d have chosen reconstruction over demolition, but I suppose every cloud has a lining of some sort. “Enjoy it,” I said, and turned homewards. I’d had a long day, but however odd it felt to stand in the dark with a stranger and to stare between barbed steel pickets into further darkness, to walk away seemed ungracious. 45 years is the span of my life thus far, so I could imagine how it might be to wait that long. For a moment I shared in his suspense. Maybe he felt as an explorer on the brink of discovery, or like David Attenborough staking out a lion. For me, while such sightings are not an everyday event, in the holidays they’re common enough. I can watch from the ease of my kitchen through a gap in neighbouring garages. You can tell one’s coming by the steady roar, or the slow huffing from a standstill, then the play of metal on metal. With all the workings exposed, the wheels give out an honest and percussive rhythm. A driver then appears at the open cab in cloth cap and overalls, trailing a great billowing cumulus behind that muffles the edges of the present day. Fuel bunker and coaches alike are enamelled in deep burgundy, hand-edged in yellow. Through passenger windows are table lamps and lace and inquisitive faces. 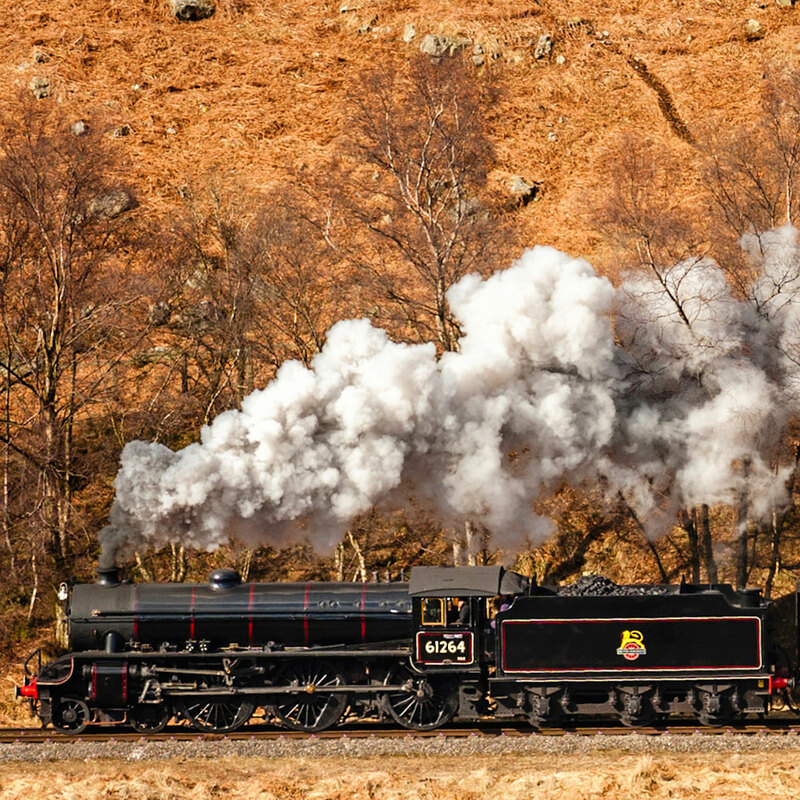 Who can deny there’s a timeless magic in steam trains. They arrive as though from a dream of childlike innocence. They could almost promise you Hogwarts or Narnia, or anywhere you wanted. His son was right, and I’d never seen it from that angle. The line of track curved towards us, bypassing the station. A long white plume first broke up the darkness, then the engine’s round face grew fuller as it started banking southwards. The ground trembled with its labours. Had we seats, they would have been the best in the house. Among my favourite sounds in the world is the whistle of a steam engine – the loudest yet gentlest warning I know. It’s enormous. It gets you right in the chest. If not for the rumble of the city it could be heard for miles around. I’m quite sure drivers sound it for sport, as the driver did that evening. It rose in a giant column of happy music, perfectly timed – or so it seemed. Then in came the 18:52 from London King’s Cross, slowing obediently for arrival, pulling ten coaches behind it and effectively pulling a curtain on our performance before it began: lipstick red alternating with concrete grey, emblazoned with logos and slogans, seat information and safety warnings. Yellow light surged from long communal windows. I could almost smell the stale coffee inside, the air leeched of all its freshness. I saw before my mind’s eye a litter of newspapers and food wrappers, the sad trundling of a refreshments trolley, the scratchy fabric on seats, passengers gazing into the glare of laptops, tablets and phones. As coach K finally passed us, so our last burgundy carriage was swallowed by the night, leaving behind it only a wisp of white and a coal-smoke fragrance on the air. “I’m so sorry,” I said, and meant it. Not that it was my fault, but somehow I felt we’d failed in our hospitality, and there was no way to make it up to him. “Well,” he answered, “that’s that,” and looked into the space now empty. “Maybe next time,” I offered hopefully. “Maybe. Thanks.” He gave a short gruff laugh, devoid of humour. I turned to leave him with his thoughts. Since then I’ve heard that steam route has been discontinued, as the railway has safety concerns. I wonder if he had more luck on the horses that day. Don’t get me wrong, I catch the train to London quite often. It’s a good service and very convenient. I’m all for safety on the railways, and anywhere for that matter. But the contrast between the two – ancient and modern, jolly and efficient, beautiful and functional – seemed almost ridiculously stark, rather like that of the heart and mind. While I wouldn’t be without it overall, the mind is a slave to its own limitations, annoyingly bound by routines and restrictions of its very own making. It has a knack of spoiling things. That incident reminded me of certain times I’ve sat down to meditate. The phone’s switched off, the candle is lit, the fragrance of incense is rising on the air, perhaps some meditative music is playing. All is still, inwardly and outwardly. Then thoughts come, with a powerful illusion of their own significance: the email I forgot to send, the things I need to buy tomorrow, other things I need to clean, arrange, create or deliver before the week is out. Suddenly I may as well be in a stuffy commuter carriage – computer screen, scratchy seats and all – while endless security announcements sound through the tannoy, along with a list of upcoming stations and an inventory of unappealing items from the buffet-car menu. How all the mundane, tedious aspects of human life – important in their own way – can fetter the wings of meditation. Just so, mind-manufactured doubts about one’s own ability, concern for the opinions of others, fear of failure, (and so on, ad infinitum), can blindside inspiration. The heart is meanwhile tireless in its simplicity and spontaneity. That is where the analogy ends, fortunately. Unlike the stranger in the alleyway, if I struggle one evening to quiet my thoughts, feeling I’ve had a fairly worthless meditation, I can say with genuine hope: maybe next time, maybe next morning rather than after 45 years or never again. I trust another chance, another heart-powered rather than steam-powered inspiration, will come along soon.